Staining is an auxiliary technique used in microscopy to enhance contrast in the microscopic image. 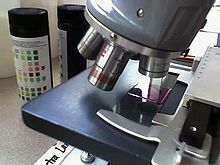 Stains and dyes are frequently used in biology and medicine to highlight structures in biological tissues for viewing, often with the aid of different microscopes. Stains may be used to define and examine bulk tissues , cell populations , or organelles within individual cells.